First Steps is the perfect program for families who need full-time, year-round childcare and are looking for a stimulating, safe, and caring environment for their children to grow and flourish. First Steps is particularly suited to the needs of two-career families who are looking for a nurturing place that they can count on every day. Many families enroll their children as infants and continue through preschool until they start kindergarten. Excellent programs, consistent, caring teachers, and great communication with parents are the hallmarks of the First Steps programs. The First Steps Infant Program is designed for children beginning as early as 6 weeks of age. Our well qualified, affectionate teachers provide predictable and consistent care. The environment is a safe and joyful one, thereby building each child’s trust and emotional security. Excellent Staff Ratios: We maintain very high staff ratios of one teacher for every two children. At especially busy times of the day such as lunch, a fifth teacher joins to help care for the eight babies. This staffing approach makes it possible for us to address each young child’s individual needs. Individualized Attention for Each Child: The schedule in the Infant Room is determined by the needs of each child. We know that young babies have very individual eating and sleeping patterns, and we follow these natural rhythms. As babies grow from the infant stage to early toddlerhood, their eating and sleeping schedules tend to be more predictable making it possible to form a class routine for mealtimes and naps. Stimulating Curriculum: Teachers continually rotate the Infant Room curriculum to address the rapidly changing developmental needs of this age group. The toys and equipment in this room change over the year as the children reach new developmental milestones. It’s not long before the younger babies, who start out in swings and bouncy seats, are rolling over, sitting up, feeding themselves, and gleefully battling over toys. For the older babies, we provide ample opportunity for running around (with their newfound walking skill, they love to chase each other! 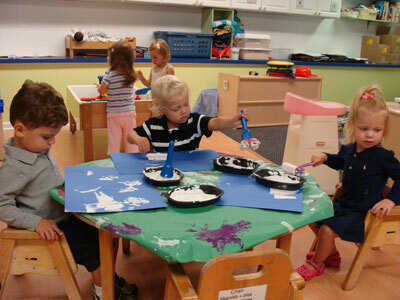 ), doing artwork (painting is a favorite), playing with playdough, and other toddler favorites. The First Steps Young Toddler Program is designed for children age one or turning one before December 31. Young Toddlers are eager to explore, learn and discover. They have, or are beginning to become mobile, through crawling and eventually walking. Our classroom environment allows for plenty of space for the children to safely develop and explore. Experienced, Caring Teachers:Our experienced teaching staff understand the importance of consistent and quality care. Patient and loving teachers embrace the children’s individual schedules at the beginning of the program. They will gently guide the children to eventually be on the same schedules for snacks, nap and lunch. Excellent Staff Ratios: There are four teachers for a class of eight young toddlers. This high staff ratio enables us to provide plenty of one-on-one nurturing. This staffing approach makes it possible for us to address each young child’s individual needs. Teacher-Family Communication: As in the Infant Room, the Young Toddler teachers communicate closely with parents to insure that they meet the emotional and developmental needs of each child. Communication is essential and allows for partnerships to develop; having thoughtful relationships with our families is critical for the successful planning that each young toddler will receive. Learning through Play: The Young Toddler’s schedules will be determined by the needs of each child. Gradually, the children will happily find comfort in routines. The collaboration between our families and teachers help to guide us through this process. The classroom itself will meet the developmental needs of every child. The children will begin to respond to questions and follow simple directions. Language development will soar. The children will begin to use more complicated gross motor skills such as, climbing onto and down from structures without help, running, walking up and downstairs, jumping on two feet and catching and kicking balls. The children will enjoy playing alongside one another. They will eventually seek out each other to play together. By year’s end these Young Toddlers will be feeling very much part of a group and ready to move onto the Toddler classroom. The First Steps Toddler Program is designed for children who are and will be turning two. Toddlers are full of natural curiosity and are beginning to take charge of their world through emerging speech and physical dexterity. Our Toddler Program provides young children opportunities to investigate their environment and experiment through play-based learning. Our primary focus is on providing a safe, warm, supportive and consistent setting that enables this exploration. Experienced, Caring Teachers: In their quest to gain independence, toddlers are masters at testing boundaries. A child may fuss or yell, “I do it myself,” as we try to help them put on their coat, only to dissolve in tears moments later and want to be cuddled like a baby. Our Toddler Room teachers understand these conflicting feelings of independence and dependence. They know when to stand back and encourage, and they step in with hugs of reassurance. Excellent Staff Ratios: There are four teachers for the class of eight toddlers. This high staff ratio enables us to provide plenty of one-on-one nurturing. As in the Infant Room, Toddler teachers communicate closely with parents to insure that they meet the emotional and developmental needs of each child. Learning through Play: The toddlers’ daily schedule includes a mix of teacher-guided group activity and individual creative play in the different activity centers of the room: art activities, a sensory table, a listening/literature area, a comfortable couch, small motor manipulatives, a large block area, and plenty of imaginary play props. Physical play is also part of the daily schedule both indoors in the common space and outdoors on the playground. Lunch and snack times are happy, social parts of the day when the children get a chance to practice self-help skills such as opening lunch boxes, pouring drinks, or putting straws in juice boxes. The toddlers also love to help set up their cots for naptime after lunch. They happily fall into this routine, and most are eager to rest after the busy morning. As each child awakens from napping, he or she goes to the common space to play, leaving the room quiet for those still asleep. By year-end, our Toddlers are a well-established social group that has mastered an amazing number of skills. They carry on conversations, show empathy for their peers, and play with rather than just next to friends. The First Steps Preschool Program is for children beginning 2.9 years old. The preschool years are a leap to independence, and also socialization: friendships that budded in our Toddler Room blossom in our Preschool and often last for many years even when children separate for Kindergarten. Life in our Preschool is learning to respect others, taking care of oneself and using equipment wisely and respectfully. To children and teachers, it is a time for sharing. Respecting and Nurturing Each Child as an Individual: The staff ratio in our Preschool is one teacher for every five children. As in our other First Steps programs, our teachers place heavy emphasis on individualized attention for each child, and close communication with parents to ensure that each child’s physical and developmental needs are met. Consistent with this philosophy, there are no toilet training requirements in our Preschool. Teachers encourage and support children in potty training, but don’t force the behavior. Rich Curriculum, Play-Based Learning: The Preschool curriculum incorporates opportunities for individual, small group and whole group learning. Our program supports a wide range of child-initiated, child-directed and teacher facilitated activities. Our preschoolers learn through play and self-initiated exploration, and spontaneous group interaction. One child picks up a set of colored shapes and begins to stack triangles. A friend looking on observes that two triangles form a square. Another child joins in and begins grouping the shapes by color. A teacher comes over to reinforce the sorting concepts that have emerged! Even lunch provides an opportunity for learning. Reading and math readiness comes from reading labels, counting the items in their lunch boxes, talking about more, less, and the same. In our Preschool, discoveries happen, children make friends, conflicts become opportunities to learn negotiating skills, and fantasy play helps children deal with the outside world.